If wedding bells or ‘pomp and circumstance’ music is on your mind, then wedding or graduation season must be nearing. Have you ever considered having your own backyard be the site of where guests could gather to celebrate a milestone? With the help of a landscaper, any yard has the potential to be the place for an outdoor wedding, a graduation party, a fundraiser -- or just to be the spot where all of your friends and family will want to gather when the weather is perfect. Choose a focal point – if you have a large backyard, envision a gazebo or fountain as the centerpiece. 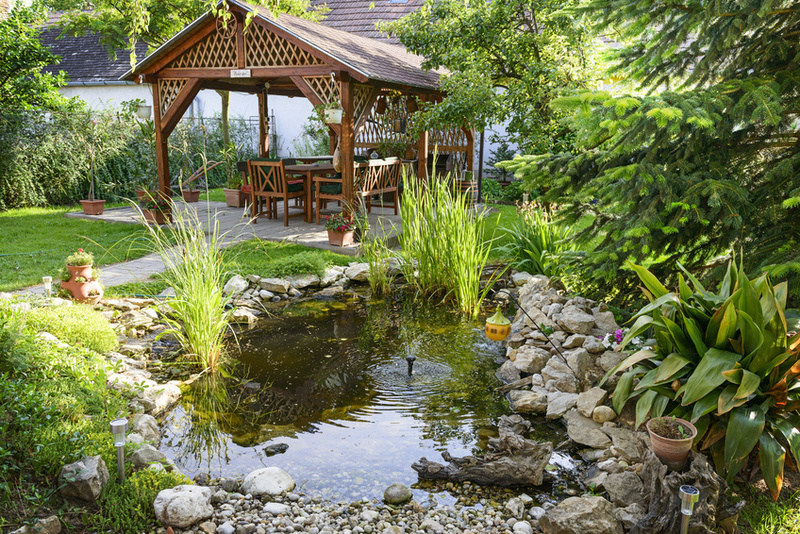 Or, if your property is smaller, a garden of flowers or a stone bench may accent your yard nicely, or adding a garden bridge over a koi pond may be a fun way to go. A focal point never fails to be the topic of interesting conversation. Hardscape, landscape - or both? Are you a fan of a walking path or a granite bench or a stone sitting wall? Or do you favor lots of plants and flowers bordering your property? Whatever appeals to you, a landscaper can make the exterior of your home reflect your personality and make it suitable for an event. Lights, Cameras - Conversation! – The right lighting sets the tone for an event and creates a soothing ambience. (Don’t be surprised if your guests take pictures with their mobile devices of how stunning your backyard looks!) Pathway, deck, or step lighting is not only a safety feature, but can keep the conversation flowing well into the night. No matter how big or small your house is, landscaping services are right for everyone. If you want to host an event for yourself or would like to rent out your property for some additional income, remember that any landscape or hardscape project done right will increase the value of your home. So whether your yard is home to a graduation party or a wedding, you can live happily ever after knowing that your property is a welcome site for guests - and a prosperous investment for you. Does Borsello create the best outdoor event and wedding venue possible? We do! Contact us today.